I have been on a baking spree ever since the holiday season started and can’t seem to stop yet. mmm I simply love the aroma of freshly baked goodies. Recently finished baking a big batch of sugar cookies, snicker doodles, chocolate chip-macadamia nut cookies and mini vanilla cup cakes for a dear friends son’s birthday bash which was on the christmas eve, but could’nt manage to click some pictures for any of them. Hubby dear and me are going to visit a dear of friend of ours, So I’m onto it again, all set with a fresh new batch of cookies but this time with a hint of coffee in it. If you are a coffee lover like me, then I promise this recipe will not leave you disappointed. 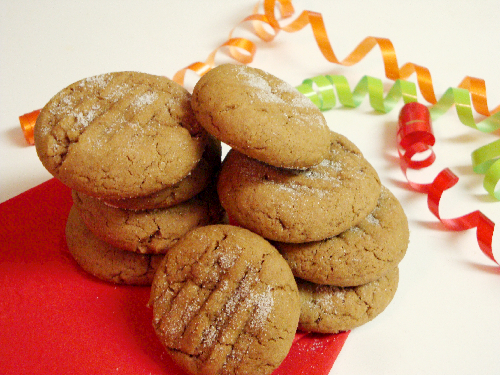 For those who are not familiar with coffee flavor in cookies, I would say what I say in all my posts, “Try it! I’m sure you’ll love it”. Now, lets take a quick peek at the recipe. I used starbucks instant coffee powder in this recipe but any instant coffee powder that you use at home may be added. Bring the butter, and egg to room temparature before you start to make the cookies. Take them out and leave it on your counter top for 10-15 mts while you measure other dry ingredients. Forgot to take the butter out? No worries, microwave on high for 10 seconds till the butter is just soft to touch yet still firm and you are all set to got! While measuring flour, Spoon it or scoop the flour into the measuring cup and level it off with a knife or spatula. Do not tap the cup on the counter top after filling the flour. In a small bowl, add 1 tbsp of hot water and the instant coffee powder. 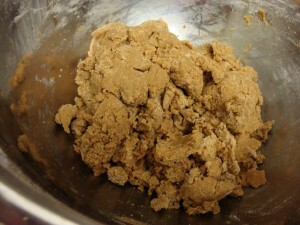 Mix it and without any lumps and set aside. 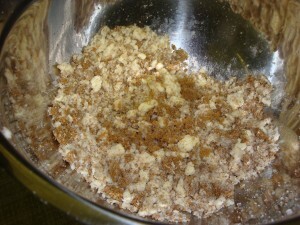 In a large bowl, add butter, brown sugar, and white sugar. 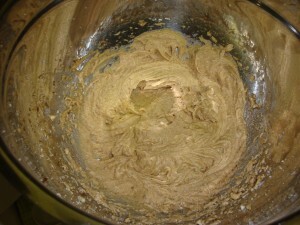 If you using a spoon mix it until well blended (see picture above). If using a hand mixer, mix it on low speed till combined. Add Milk, vanilla essence, egg. 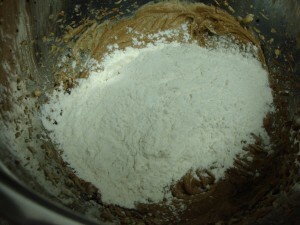 Beat till light (use low speed if using a hand mixer) and the mixture turns to a creamy texture as shown in the picture above. Add the coffee mixture and combine. 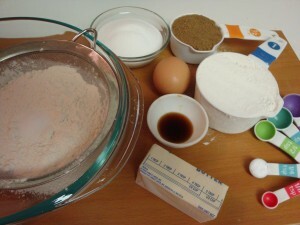 Add dry ingredients (flour, baking soda, baking powder, salt) and mix it till just blended (see picture above). Do not over mix. 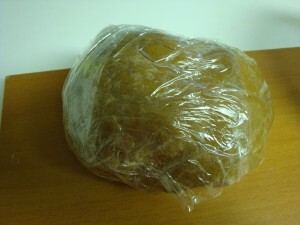 Cover the dough with a plastic foil as shown above and refrigerate it for 15 mts. Meanwhile, preheat the oven to 400 degrees Farenheit. Bake in the pre-heated oven for not more than 8 – 10 mts or till edges are slightly toasted. Do not over bake, since the bottom portion of the cookies gets burnt easily. Remove the cookies onto a wire rack immediately and allow to cool completely. The cookies are soft to touch as soon as they are taken out of the oven, but turn hard once cooled. Store them in an airtight container and enjoy with a hot cup of coffee/tea. Is it compulsory to add dark brown sugar? You can add white sugar too. The texture of the cookies might differ although the sweetness would be the same. Hope that helps. I tried these cookies this weekend.But they came out very hard.Any tips???? – since oven temparatures vary from one to another, try reducing the cooking time a bit less. remove the cookies slightly earlier than the cooking time if you would like to have soft cookies. – A tip that might work when cookies turn out hard is, place the cookies in a ziplock bag, along with a slice of bread and leave it overnight. This will help the cookies turn soft. – Also, after baking the cookies, remove them on to a cooling rack immediately. If you leave the cookies in the pan, even though after removing them from the oven they still continue cooking as the pan will be hot and the cookies turn out hard. Hope this helps. Try the bread trick. I have’nt encountered a hard cookie incident so far but I believe it should work. Thanks for the tip.I will try this. Great! I’m glad it worked. have you ever done the recipe with macadamia nuts? i’ve been searching for a coffee macadamia nut recipe that rivals a product that Kings Hawaiian bakery (in California) makes… your recipe sounds awesome. 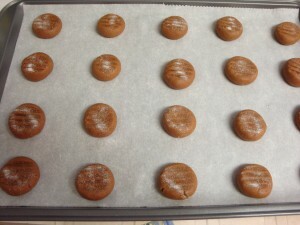 After looking at the simplicity of this recipe I think I just might have me some coffee cookies soon. Can you use regular coffee grounds or it must be instant?